For the second weekend in a row, I was on an early morning flight to Austria. This time we were heading for Salzburg where we picked up a hire car for the drive to Bad Bleiburg. Once we worked out how to change the sat nav from what appeared to be a Scandinavian language to English, the drive was relatively straight forward. 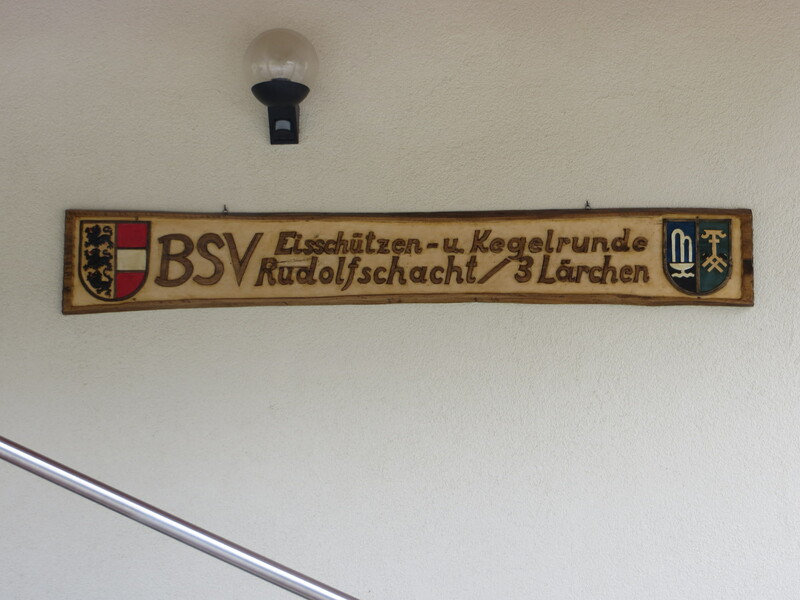 As we headed through the mountain tunnels, the place names on the signs indicated that we were travelling through the towns that had constituted my favourite ski area when I lived in Austria. It brought back very happy memories, but I don’t think I had ever visited that region when the slopes were green. As we came off the motorway following the sat nav directions to Bad Bleiburg, we were a little concerned to find ourselves on a steep, narrow road through the forest that was difficult enough to negotiate in Summer. Sure enough, barriers at both ends indicated that it can be closed in Winter. On arriving in the village, we decided to have a look at the facilities. Unlike the 30,000-seater stadium that we visited last week, this was a proper pre-season ground. The standing area was mostly on one side with a small stand along half of that side of the ground and we were looking down onto the playing area with the mountains providing a picturesque backdrop. What looked like a media box turned out to be the VIP section consisting of a couple of high seats with cup holders. 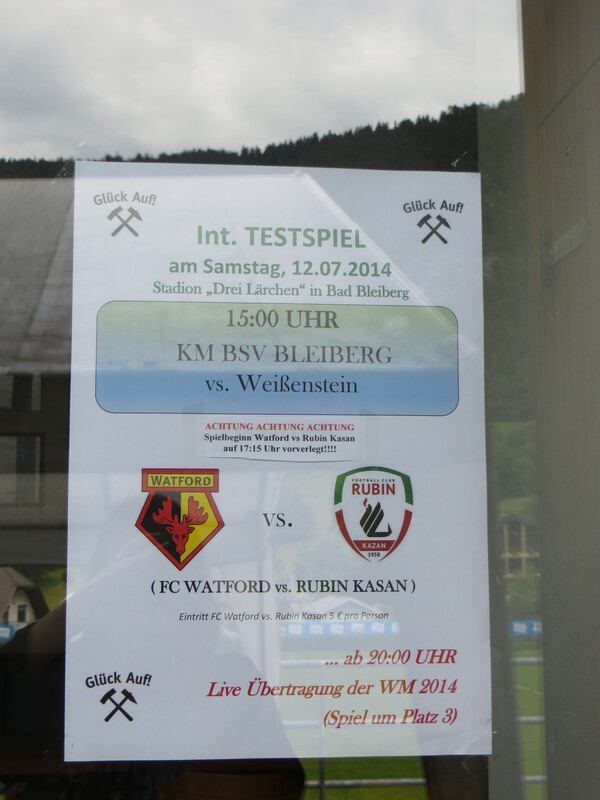 There were posters advertising our games over the weekend, which also indicated that there was a double-header planned for that afternoon with the local team playing Weiβenstein at 3pm. After a detour for lunch and to check-in at our hotel, we arrived just before half-time in the warm up game to find the score was 2-2, which was a decent score against a team that we were told were from the division above our hosts. The game was being played in blazing sunshine, so a beer was in order and then we were all set for the second half in which the visitors scored two additional goals thanks to some spectacularly bad goalkeeping. The first being a free-kick which rather drifted in with the keeper berating his wall when it appeared that a step to his left would have allowed him to catch the ball which was hardly moving at pace. The final goal was a speculative shot from the half way line. The car park, such as it was, had filled up so I wondered where they would find space for two coaches. The Rubin Kazan team arrived and parked up and, soon after, our lads appeared through a gap in the hedge at the opposite side of the ground, having walked across the road from their hotel. 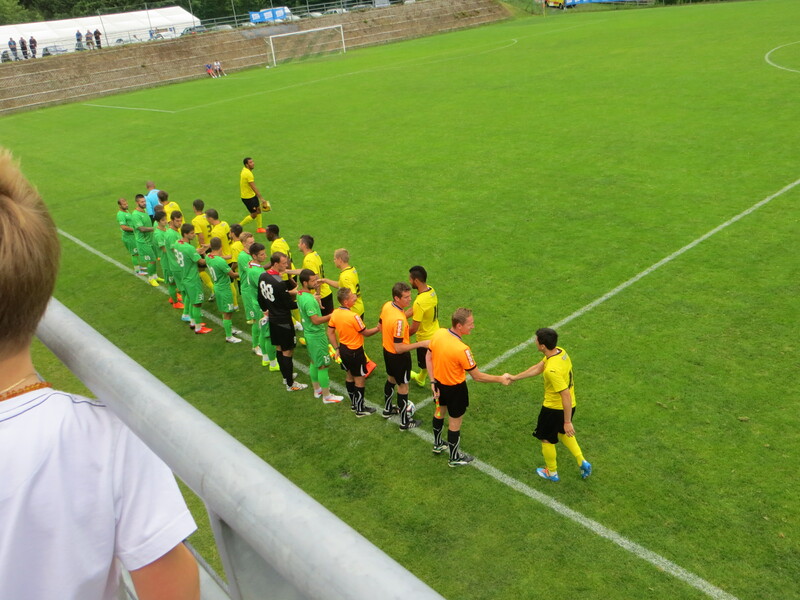 They crossed the pitch and then came up a covered stairway to the dressing rooms. There had only been a couple of other Watford fans at the warm-up game but, as kick-off time approached, a few familiar faces appeared to supplement the local crowd. Evidently there were some tricky pre-match negotiations between the officials of the two clubs, as I heard the conclusion that the game would be played with the Rubin Kazan ball in the first half and the Watford ball in the second. The starting line-up for Watford was Gomes, Doyley, Tamas, Angella, Pudil, Tözsér, Battocchio, McGugan, Forestieri, Vydra and Deeney, who was captain for the afternoon. The Rubin Kazan team lined up wearing the highest numbers that I have ever seen in a football match. As the captains met for the pre-match formalities, which included swapping pennants, the referee was heard to ask if there was a spare pennant for him. Deeney dutifully went back to the Watford staff to relay the referee’s request. With two minutes on the clock, Kverkvelia flattened Pudil. McGugan took the free-kick which was pushed just wide by the Russian keeper, Filtsolv. Rubin Kazan launched an attack, which we were struggling to clear. Thankfully it finished with a shot from Kislyak that Gomes claimed. The Russian team then had a really good spell. First, a cross from Kverkvelia was played back to Getigezhev who blazed over. Then a snap shot from the left required a good reaction save from Gomes. On 18 minutes, Livaja curled a shot wide of the near post. There was some respite as Watford won a free kick which was well taken by Tözsér but Filtsolv leapt and tipped it over the bar. From the corner, Deeney headed past the keeper, but our celebrations were cut short as the referee indicated a foul that none of our party saw. A clever dummy by Battocchio allowed the ball to reach Doyley in the box, but his shot was blocked. At the other end, Mullin tried a shot from distance that flew wide of the near post. There was a bit of handbags then as Forestieri fouled Mullin, who screamed in agony as he went down. Fernando was having none of it and tried to pull him to his feet. The Russian angrily leapt up and Deeney rushed over to get between them. The Russian then collapsed in agony again to derision from the travelling Hornets, but he got his way when Forestieri was booked for the challenge. Nabiullin tried a weak shot that was easily gathered by Gomes. 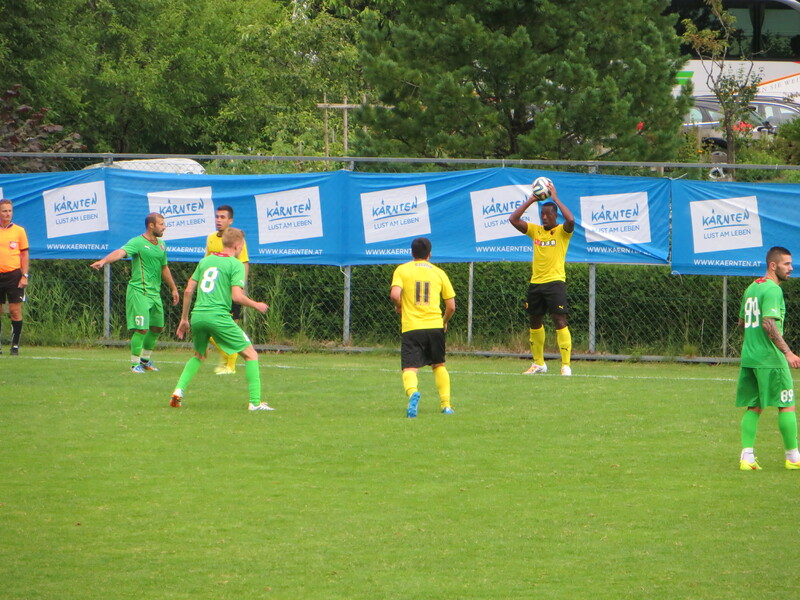 In the 38th minute, Tözsér took a free kick from the right that went over the bar. Revenge is a dish best served cold and, just before half time, Fernando fell theatrically under a challenge from Mullin and his rival’s name joined his in the referee’s book. The resulting free kick from McGugan was disappointing and easily gathered by Filtsolv. Rubin Kazan threatened as the ball was given away on the wing, but Pudil stopped the danger with a great challenge in the box and eventually a corner was conceded. From the set piece, the ball broke dangerously in the box but Pudil was on hand again to clear. The half finished with a couple of chances for the Russians, but they continued to be wasteful as, first, Burlak launched a shot from a mile out that flew well over the bar. Then a header from Livaja was well wide of the target. It had been an enjoyable half of football with the Russian side providing a much sterner test than the two previous games in Austria. They’d had a number of chances early on that they really should have done better with, but we were happy enough going into the break on level terms. During the interval the heavens opened, but that wasn’t to deter those of us standing at the side of the pitch. A bit of rain never hurt anyone. At half time, Ekstrand, Anya, Dyer and Abdi replaced Angella, Vydra, Forestieri and McGugan. Five minutes into the half, there was a fantastic move as Anya fed Deeney, who played a through ball to Dyer in the box, but a defender was on hand to take the ball from his feet. In another cracking move, Battocchio fed Abdi who found Dyer who unleashed a vicious shot that cannoned back off the crossbar. It fell to Deeney whose shot was blocked and cleared. After what had been a really good spell for Watford, a chance fell to Devic but his shot was easy for Gomes. 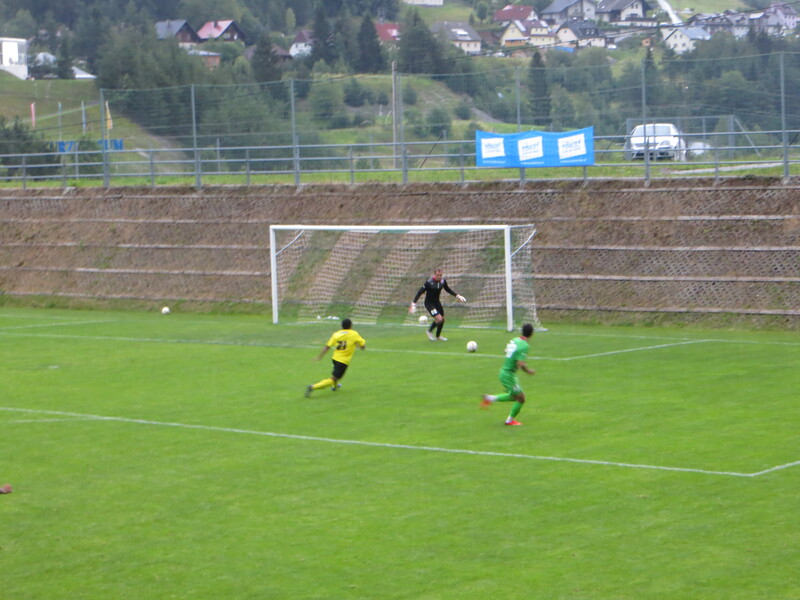 Just before the hour, Abdi tried a speculative shot that was put out for a corner. At this point Burlak, who was wearing 4 for Rubin Kazan, was replaced by Diakhite, who was wearing 99. I can only think that Burlak’s shirt number was deemed too low. 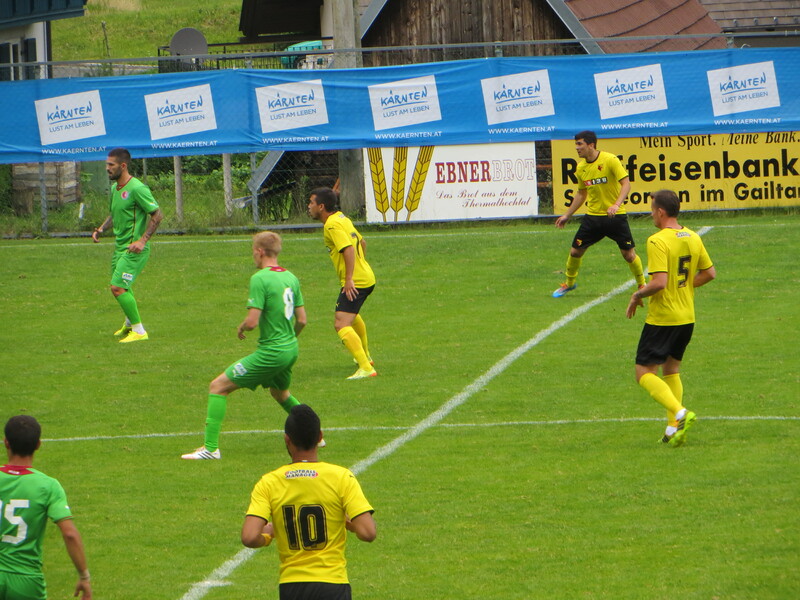 There was danger for Watford as a free-kick from Karadeniz flew just over the bar. Then there was a slight delay to the game as Pudil left the ground and appeared to go into a neighbouring garden to retrieve the ball. Abdi and Battocchio combined before passing back to Deeney whose shot was blocked. The opposition were struggling to cope with our pace upfront and Anya was the next to break into the box but shot wide of the target. At the half-way point in the second half Murray replaced Tözsér. The Russians threatened with a back header from Asmoun which Gomes caught. On a side note, Asmoun was wearing no 69 provoking sniggers from the less mature among our support (most of us). Then Pudil tried a shot from distance that flew over the bar. There was a spate of substitutions as Ranegie replaced Deeney, Hoban came on for Tamas and Fabbrini for Forestieri. By this stage, the incessant rain meant that my notebook was a sopping mess, and any notes that I managed to make are barely legible. But I believe there was some lovely interplay between Fabbrini and Anya whose shot was blocked. Then Fabbrini, Ranegie and Dyer combined, this time it was Fabbrini’s turn to shoot, but his effort was also blocked. Doyley was replaced by Brown. At this point, the conditions meant that note-making was almost impossible but I did note a decent Watford chance as a double shot from Ranegie was blocked followed by a great shot from Pudil that was deflected wide. Doherty came on to replace Pudil for the final couple of minutes. When the final whistle went, those of us who had stuck it out watching from the side of the pitch were soaked through. The Watford squad waved goodbye and then disappeared through the hedge again to walk back to their hotel. Despite the goalless scoreline, it had been an enjoyable game with Watford excellent in the second half. It may seem sacrilege to suggest playing without Vydra and Forestieri in the starting line-up, but the thought of a front three of Dyer, Deeney and Anya terrorising Championship defences makes me very excited indeed. As for the return of Tözsér, my shout of “welcome home” to him when he arrived at the ground was heartfelt and he didn’t disappoint in the game. We went in search of some warmth and somewhere to eat. The only place in wheelchair pushing distance was the hotel where the team were staying. We tried to keep a respectful distance although I did beckon Doyley over for a kiss. Beppe kindly came over and shook all of our hands and bought a round of drinks. Since eating at the hotel didn’t seem to be an option, and we wanted to leave the players in peace, we made our way back towards town for dinner where we were joined by Gary and Dan, who we’d met in the ground so spent a lovely evening chatting about all things Watford. Saturday was my birthday. I had a lovely day watching Watford play in a gorgeous part of the world and even had a kiss from Lloyd Doyley. I can’t imagine any better way to have spent the day. This entry was posted in Watford FC and tagged Almen Abdi, Cristian Battocchio, Daniel Pudil, Daniel Tozser, Diego Fabbrini, Fernando Forestieri, Gabriel Tamas, Gabriele Angella, Guiseppe Sannino, Heurelho Gomes, Ikechi Anya, Joel Ekstrand, Josh Doherty, Lewis McGugan, Lloyd Doyley, LLoyd Dyer, Matej Vydra, Mathias Ranegie, Reece Brown, Rubin Kazan FC, Sean Murray, Tommie Hoban, Troy Deeney, Watford FC on July 14, 2014 by franelynn. Frances, what a lovely write up! Thank you so very much, absolutely super. Only just read it – too late.